I am a child of the mountains. Now, I don't mean that I grew up in the mountains, although I do hail from the rolling hills of Southern Ohio, which, as my Father impressed upon me at an early age, are a part of the foothills of The Appalachian Mountains. More importantly however, during my formative years, Dad took me and my younger brother on two annual trips to The Great Smoky Mountains National Park, once in the Summer and once in the Fall...to "see the leaves change" as he liked to say. These trips were usually "just us boys." My Dad, brother, and I shared a special bond with each other and with the mountains, which only grew stronger with each trip. One of the highlights of any Smokies trip is a drive over the Newfound Gap Road, which is a high mountain road that traverses the border of Tennessee and North Carolina. Dad - and later when we were old enough to drive - my brother and I loved to make a day of it. Naturally, when I got older and started taking my own vacations, I was drawn to destinations with lofty vistas. In the last two decades I have driven on as many high mountain parkways as my stomach could handle. Some people like roller-coasters: I like driving, or even better, riding shotgun, in the mountains. 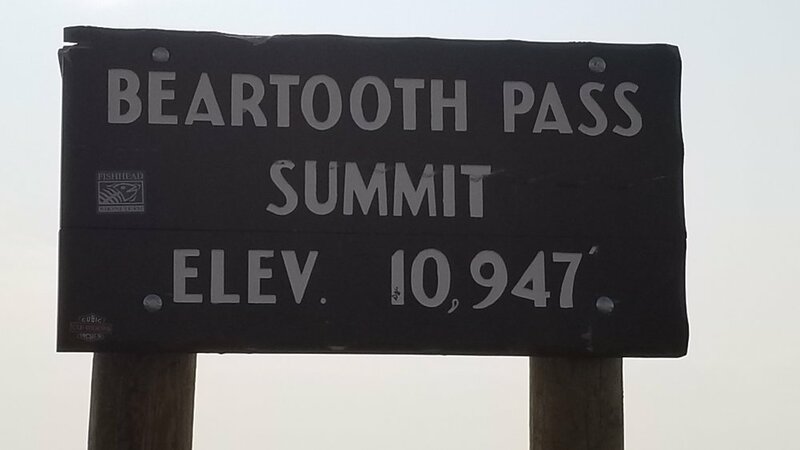 One such road that I have eyed on the map since I was a kid is The Beartooth Highway, a road that runs along a stretch of border between Montana and Wyoming, and crosses Beartooth Pass at nearly 11,000 feet above sea level. It is one of the highest mountain roads in The United States, and it is only open for a small window of time in the summer. For various reasons Heather and I had never been able to drive it in the previous three times we visited the Yellowstone region, so this time I had my heart set on it. We began the day at a rest area on I-25 south of Buffalo, Wyoming. Interestingly, the town was not named for Buffalo Bill, as was the nearby tourist town of Cody, but rather because when the time came to choose a name for their new settlement, the 30 citizens of the town put suggestions in a hat, and one man wrote his hometown of Buffalo, New York. A little farther north, near the large-by-Wyoming-standards town of Sheridan, we turned off onto US Route 14 and headed west into the town of Dayton. We always enjoy finding towns with Ohio names when we travel. Dayton, Wyoming is an exponentially smaller place than its Ohio namesake, but still large for Wyoming. Keep in mind that the entire state, which is over twice the size of Ohio, has a population smaller than the city of Columbus. These stats, however, don't take into account the millions who visit annually, but more on that in a future post. West of Dayton, Route 14 and Alt Route 14 are known as The Bighorn Valley Scenic Byway. I am a big fan of guidebooks, and one that we brought with us on this trip is a National Geographic "Scenic Byways Of The United States" guide, which covered both this drive and The Beartooth. So we were able to stop at points of interest as we drove, and already knew something about them. Shortly after leaving Dayton, we encountered a large number of cars parked on the side of the road, and people standing outside taking photos towards the woods. We thought it must be a bear siting, or "Bear Jam" (named for the traffic jams bear sitings cause in National Parks), but it wasn't. It was, however, a beast just as elusive...a Bull Moose! We have seen several Moose in the wild during previous travels, but they were almost always Cows, and even once a Cow and Calf. We had even seen two Bulls together years ago at Rocky Mountain National Park, but they were behind a lot of tree cover and we couldn't get a full look at them. But this guy was right out in the open munching on some Willow branches. I hate to admit it, but we spoiled it for everyone when we pulled over. Bullwinkle looked right at us as I was trying to snap his photo, and began walking away...right behind our car! We then rolled on, leaving everyone there cursing us I am sure. About 50 miles west on the Alt 14, we came to Medicine Wheel National Historic Site, which is an ancient circle of rocks (placed there by people, not a natural formation) that is sacred to nearly all Native American tribes. Some wait their entire lives to visit "The Wheel," and it is considered such hallowed ground that some purify themselves for up to a year in preparation for their pilgrimage. After driving the side road up Medicine Mountain, we came to the visitors center, which was a glorified hut manned by two friendly rangers. One of the rangers greeted us and the others who arrived at the same time as us and explained the basics. It was a three-mile round-trip hike along the rest of the mountain road, uphill both ways. That wasn't hyperbole, as the road was laid out like the letter M. She also impressed upon us the sacred nature of the place and said that they have Native Americans come almost daily to pray and make offerings, so we should treat it with the same respect as we would any church. The hike itself wasn't terribly strenuous, as we had been preparing ourselves with hikes in Ohio over the Spring and Summer. When we reached The Wheel we were the only ones there for a few minutes, and the spiritual nature of the place was best described as eerie. The various prayer ribbons and offerings were interesting to see, and even moving. Typical offerings included tobacco, sage, bundles of herbs, flowers, and animal skulls (there were several big cattle ones). We took photos and had our moment to reflect, and back down the mountain we went.